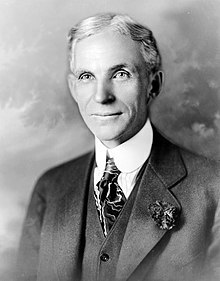 Henry Ford (July 30, 1863 – April 7, 1947) was the founder of the Ford Motor Company. He was one of the first to apply assembly line manufacturing to the mass production of affordable automobiles. There are more people who surrender, than those who fail. I don’t know whether Napoleon did or did not try to get across there and I don’t care. I don’t know much about history, and I wouldn’t give a nickel for all the history in the world. It means nothing to me. History is more or less bunk. It's tradition. We don't want tradition. We want to live in the present and the only history that is worth a tinker's damn is the history we make today. International financiers are behind all war. They are what is called the international Jew: German-Jews, French-Jews, English-Jews, American-Jews … the Jew is the threat. I've never made a flight in an airplane, and I don't know that I'm particularly anxious to. I would, though, like to take a trip in a dirigible. Bring one out here some time, won't you, Doctor Eckener, and give me a ride? I adopted the theory of Reincarnation when I was twenty six. Religion offered nothing to the point. Even work could not give me complete satisfaction. Work is futile if we cannot utilise the experience we collect in one life in the next. When I discovered Reincarnation it was as if I had found a universal plan. I realised that there was a chance to work out my ideas. Time was no longer limited. I was no longer a slave to the hands of the clock. Genius is experience. Some seem to think that it is a gift or talent, but it is the fruit of long experience in many lives. Some are older souls than others, and so they know more. The discovery of Reincarnation put my mind at ease. If you preserve a record of this conversation, write it so that it puts men’s minds at ease. I would like to communicate to others the calmness that the long view of life gives to us. There's just one thing that's permanent in this world, and that's change. And when a man gets too old to change, why, then, he dies. And after that, who knows? Do we go on somewhere else? We'd all like to think so; it seems sometimes as though something inside us was telling us that we do. But if we do live on, then one thing is sure: The fellows who are afraid all the time that they may lose what they've got will lose out over there just the way they lose out here. And the big prizes will keep right on going to the fellows who do their duty and have faith. That's all there is to happiness, according to my way of thinking—just doing your duty and having faith. Money doesn't change men. It merely unmasks them. If a man is naturally selfish, or arrogant, or greedy, the money brings it out; that's all. Let them fail; let everybody fail! I made my fortune when I had nothing to start with, by myself and my own ideas. Let other people do the same thing. If I lose everything in the collapse of our financial structure, I will start in at the beginning and build it up again. What we need is some financial engineers. Henry Ford and Samuel Crowther (1922), My Life and Work, Garden City Publishing Company, Inc.
We have only started on our development of our country — we have not as yet, with all our talk of wonderful progress, done more than scratch the surface. The progress has been wonderful enough — but when we compare what we have done with what there is to do, then our past accomplishments are as nothing. When we consider that more power is used merely in ploughing the soil than is used in all the industrial establishments of the country put together, an inkling comes of how much opportunity there b ahead. And now, with so many countries of the world in ferment and with so much unrest everywhere, is an excellent time to suggest something of the things that may be done — in the light of what has been done. When one speaks of increasing power, machinery, and industry there comes up a picture of a cold, metallic sort of world in which great factories will drive away the trees, the flowers, the birds, and the green fields. And that then we shall have a world composed of metal machines and human machines. With all of that I do not agree. I think that unless we know more about machines and their use, unless we better understand the mechanical portion of life, we cannot have the time to enjoy the trees, and the birds, and the flowers, and the green fields. I am not a reformer. I think there is entirely too much attempt at reforming in the world and that we pay too much attention to reformers. We have two kinds of reformers. Both are nuisances. The man who calls himself a reformer wants to smash things. He is the sort of man who would tear up a whole shirt because the collar button did not fit the buttonhole. It would never occur to him to enlarge the buttonhole. This sort of reformer never under any circumstances knows what he is doing. Experience and reform do not go together. A reformer cannot keep his zeal at white heat in the presence of a fact. He must discard all facts. The economic fundamental is labour. Labour is the human element which makes the fruitful seasons of the earth useful to men. It is men 's labour that makes the harvest what it is. That is the economic fundamental: every one of us is working with material which we did not and could not create, but which was presented to us by Nature. As long as we look to legislation to cure poverty or to abolish special privilege we are going to see poverty spread and special privilege grow. Failure is only the opportunity more intelligently to begin again. There is no disgrace in honest failure; there is disgrace in fearing to fail. p. 72. 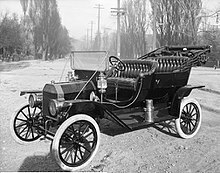 Chapter IV, : Remark about the Model T in 1909; this has often been paraphrased, e.g. : "You can have any color as long as it's black." I will build a car for the great multitude. It will be large enough for the family, but small enough for the individual to run and care for. It will be constructed of the best materials, by the best men to be hired, after the simplest designs that modern engineering can devise. But it will be so low in price that no man making a good salary will be unable to own one — and enjoy with his family the blessing of hours of pleasure in God's great open spaces. The man who has the largest capacity for work and thought is the man who is bound to succeed. He draws upon his subconscious mind. If there is any certainty as to what a businessman is, he is assuredly the things Ford was not. I regard Ford as my inspiration. Adolf Hitler, attributed in Bill McGraw, "Forced Labor and Ford: History of Nazi Labor Stares Ford in the Face", Detroit Free Press, 21 December 1999, p. B1; as cited in Timothy W. Ryback, Hitler's Private Library: The Books That Shaped His Life, p. 71 & footnote p. 275. It will take a hundred years to tell whether he helped us or hurt us, but he certainly didn't leave us where he found us. It is perhaps well enough that the people of the Nation do not know or understand our banking and monetary system, for if they did I believe there would be a revolution before tomorrow morning. The days are fast slipping away when the fear of credit curtailment will avail, or when wordy slogans will affright. The people are naturally conservative. They are more conservative than the financiers. Those who believe that the people are so easily led that they would permit the printing presses to run off money like milk tickets do not understand them. It is the innate conservation of the people that has kept our money good in spite of the fantastic tricks which financiers play-and which they cover up with high technical terms. The people are on the side of sound money. They are so unalterably on the side of sound money that it is a serious question how they would regard the system under which they live, if they once knew what the initiate can do with it. Patrick Vlaskovits, "Henry Ford, Innovation, and That “Faster Horse” Quote," in Harvard Business Review, August 29, 2011. Any man who thinks he is going to be happy and prosperous by letting the government take care of him should take a close look at the American Indian. This page was last edited on 30 August 2018, at 14:53.